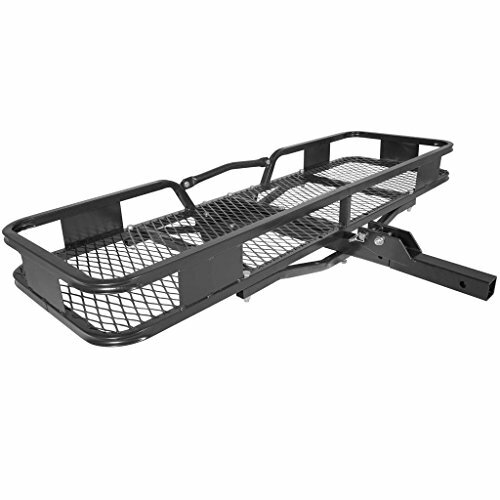 Bring more gear in a sturdy and attractive way with the Titan Ramps 500 lb cargo carrier. Its durable heavy duty construction will hold gear for your camping trip, road trip, tailgate party and more. Simply attach to your vehicle's 2" receiver hitch and pile your things onto the large 60" x 19 3/4" mesh platform and you're ready to go! The powder-coated finish is easy to clean and resistant to the elements, rust, and scratches. Titan Ramps carries a wide array of cargo baskets, trailers, ramps and other towable items. - Ball hitch: 2" x 2" x 10 1/4"
Dimensions: 4 1/2" deep, 19 3/4" wide, 60 1/4" long; Ball hitch: 2" x 2" x 10 1/4"
If you have any questions about this product by Titan Ramps, contact us by completing and submitting the form below. If you are looking for a specif part number, please include it with your message.